The RAMS website and databases are developed and hosted by the Flanders Marine Institute (VLIZ). The RAMS content is managed by an Editorial Board comprising an Executive Committee and associate Taxonomic Editors. The RAMS Executive Committee plays an advising role in the development of RAMS and proposes Taxonomic Editors. It links with the SCAR-MarBIN International Steering Committee. To allow RAMS to be as exhaustive as possible, the role of the network of Taxonomic Editors is crucial. These Taxonomic Editors are world experts on the taxonomy of their relevant taxa and are in charge of the content and quality control of data for their specific group. As a user or developer you can use the RAMS web service to feed your own application with standard RAMS taxonomy. 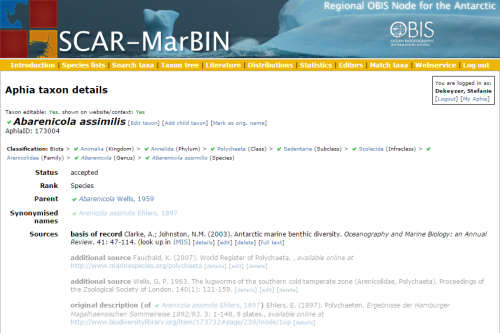 RAMS is a Regional Species Database within the World Register of Marine Species (WoRMS).